This fly is included here partly because it is so visually attractive (both to the angler and, it would seem, the fish) and partly because its history throws light on the kinds of transformations that took place when British flies came to America. It also provides a great opportunity for name dropping. The Leadwing Coachman may be taken by fish to represent a freshly emerged gray sedge/caddis fly or a female swimming down through the water column to lay her eggs, which occurs in many caddis species. In its original form the Coachman was created in England in the 1830s by one Tom Bosworth, a keen and accomplished angler and the carriage driver to a succession of British monarchs from King George IV, through William IV to Queen Victoria. The first of these was on the throne when Tom first wound a body of peacock herl, wrapped a brown hackle and tied on two backward-slanting slips of white wing pinion for wings. He intended this wet fly for night fishing but it proved equally effective in the daytime, and Tom later added a grey- winged version called the Leadwing Coachman, using grey mallard slips for wings and looking somewhat like a grey caddisfly. Both these flies made their way across the Atlantic, where they became extremely popular—ridiculously so. Her book, Favorite Flies and Their Histories, provides plenty of supporting evidence for her assertion. Her father had sent out a letter several years earlier to anglers throughout the US and Canada asking for, among other things, a list of their favourite flies. The majority of her book is composed of the anglers’ responses—hence the title—and a remarkable number of the American respondents cite the Coachman among their top flies. A good number of fishers also ranked one of the world’s most recognizable flies—the Royal Coachman—among their top choices. This fly was reputedly created in New York City in 1878 by a professional fly-dresser—and possibly the first vendor of fly-tying materials in the US—named John Haily, who had a store on Henry Street. In response to a client’s request for some Coachmen that would be extra strong, Haily added a band of red silk in the middle of the fly to protect the peacock herl body and prevent it from fraying. In its original form it lacked the red tag that became part of its final look. In his own words, taken from a letter he wrote to Charles Orvis, “I have also added a tail of the barred feathers of the wood-duck, and I think it makes a very handsome fly.” Few people would disagree. Within a few years it was to become one of America’s most popular flies for brown trout—especially large ones. Charles and a few friends, including his brother, were examining an example of the fly that Haily had sent when one of them said, “Here is a fly intended to be a Coachman, yet it is not the true Coachman; it is quite unlike it, and what can you call it?” According to Mary Orvis Marbury, her uncle chimed in, “Oh, that is easy enough; call it the Royal Coachman, it is so finely dressed!” The regal title—singularly apt given that the inventor of the original fly was in- deed a royal coachman—not only stuck but has also been taken up by a host of flies that share the Royal Coachman’s sartorial flair. When Theodore Gordon, creator of the Quill Gordon (see page 72), began investigating dry flies in the early 1890s he designed floating versions of several common wet flies, and one of these was the Royal Coachman. The upright pinion slip wings were replaced with outward curving white male wood duck breast feathers and the fly became the Fan Wing Royal Coachman in his hands. He was a professional fly tyer and at the request of Leslie Petrie he also created a version using yellow silk in place of the red—the Petrie Royal. 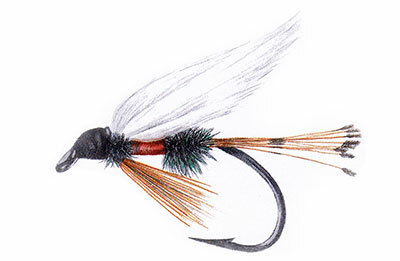 Edward R. Hewitt applied his bivisible technique to the Royal Coachman by doing away with the wings and adding a white hackle in front of the standard brown hackle, and the Royal Coachman Bivisible soon proved its worth on the Neversink. Over the years the barred wood duck feather tail has generally given way to golden pheasant tippet for most Royal patterns, but red and brown hackle, deer, moose, and elk hair have also been used. Variations on the theme include a soft-hackle Royal Coachman, a bucktail streamer, a hair-bodied Royal Humpy, and the Royal Trude, with a white hair down-wing, that can be used dry or wet. Its creator was Carter Harrison from Chicago, who tied it at A.S. Trude’s Idaho ranch near Henry’s Fork in 1906. The first version was a joke, tied on a gaff hook using red yarn from a rug and hair from the family’s span- iel, that Carter presented to his host, but in the sober light of day he tied the design for real and tried it out on the Buffalo River, where the cut- throat trout gave it their seal of approval. One of the Royal Coachman’s most distinguished descendants is a highly buoyant hair-wing version with a split or single wing of white calf tail, invented by Q.L. Quackenbush in about 1930 for use in the Catskills and first tied by Reuben Cross (initially with an impala tail wing). Quackenbush’s fellow members in the Beaverkill Trout Club called it the Quack Royal but, due to its similarity to the Lee Wulff hair-wing patterns (see page 104) that had been developed just a year or two earlier in the Adirondacks to the north, it soon became known as the Royal Wulff. 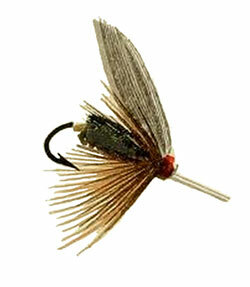 It remains a very popular fly today. What the Royal Coachman and its many cousins actually represent to the fish remains a mystery, with suggestions ranging from flying ants to certain mayfly species, but it remains an effective attractor pattern and that shiny red cummerbund continues to work its magic. Excerpted from “The History of Fly-Fishing in Fifty Flies” by Ian Whitelaw, illustrations by Julie Spyropoulos © Stewart, Tabori & Chang, 2015. 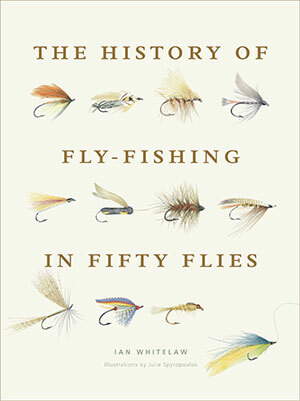 Buy “The History of Fly-Fishing in Fifty Flies” in the MidCurrent store.